In this video Fr. Mike talks about how who you spend time with effects the person you are and become. He speaks about how we are the average of the five closest friends! + Who do you spend your time with? + Are you genuinely happy with them? + Are their friendships fulfilling? + Are they good influences on your time? + Do you spend time doing things that you know you shouldn't? In this 2 part series we will be looking at how God uses life's messes to make master pieces. All too often we expect life to go according to our plan! We work in the direction we think we should go. Often times we hit a rough patch and maybe that rough patch is followed by another rough patch. We get upset, we get frustrated, and we get angry. We grow angry at God because something didn't go according to our plan. Sometimes we just feel like messes. We see our failures. We see our sins. We get discouraged. We forget that sometimes we too, are beautiful messes. What appears to be something different and strange can be unique and incredible! Like the picture below, to some it seems a pointless to others it's captivating. The value of this painting is WELL over $100,000,000. Just like each of us, we may seem crazy, messy, out of control. But to God... you're worth more than EVERYTHING else! The people we surround ourselves with influence our time. And we influence their time. Are we bringing others closer to Christ? + If we aren't why not? +Are we being the people we are called to be? +Are we being selfish, Prideful? Are we gossiping? +Are we choosing sinful acts? With this video Fr. Mike provides us excellent thoughts for us to reflect on. If we ask ourselves where we can better, and honestly ask ourselves, we will see there is always room for improvement! If you haven't seen the video or would like to view the video you can see it here! 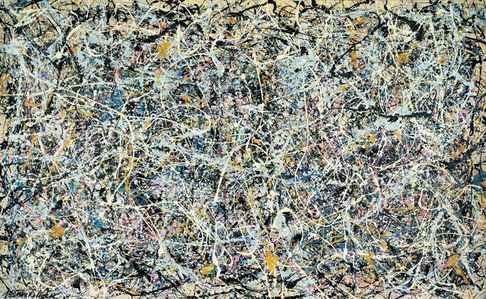 The above picture is a Jackson Pollock Original this piece is titled Number 1, 1949. Number 1, 1949 was made with thinned paint and cans of commercial enamel. For it and other works of this period, Pollock rejected single points of reference and figural representation to create completely abstract all-over compositions.